Herniated disc surgery, minimally invasive | joimax Inc. Most back pain without nerve root symptoms typically responds well to conservative methods of treatment. However, if severe pain and neurological symptoms, associated with impairment of nerve function, cannot be brought under control with conservative solutions, a neurological examination (i.e. of the central nervous system) is usually carried out, and surgery considered. No one likes to undergo surgery, but for many patients with herniated discs, it is the only way to relieve their pain permanently and return to normal life. If the surrounding nerves have already been affected and pain has become unbearable, or symptoms of paralysis are apparent, conservative methods, such as physiotherapy, are no longer sufficient. When sensory disturbances become aggravated, paralysis develops or even organ dysfunction, surgery must be done soon. In these cases, there is a risk that the nerve roots will become irreversibly damaged. In such an operation, the doctor removes the bulged disc tissue that is pressing on the nerves. All surgical methods aim to remove as much of the extruded disc tissue as possible while preserving the surrounding tissue, in order to give the clamped nerve root more space. This has to be done as gently as possible without disrupting neighboring tissue. The standard procedure for a herniated disc is microdiscectomy (discus = intervertebral disc, ectomy = surgical removal). This open microsurgical operation is performed through a short three to five centimeter-long incision above the spine. The surgeon uses a surgical microscope and specially-designed instruments to identify the slipped disc material, which is then removed with precision tools. The patient usually feels much better immediately after the surgery, but there is a small risk of scarring at the incision site. The operation is performed under general anesthesia with the patient in the prone position. Classic open surgery is quickly being replaced by modern surgical techniques. 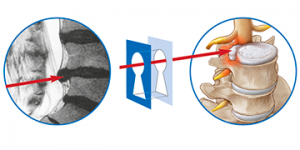 For instance, minimally invasive surgery for disc surgery, in which the surgeon works through a “keyhole” using sophisticated instruments and devices – virtually ending the need for a scalpel. This less invasive, gentler endoscopic technique is a particularly low-impact treatment for herniated discs. The standard two to three centimeter-long incision on the back is no longer needed, because the surgeon performs the operation by inserting a hollow needle through a tiny puncture. The gentle endoscopic approach allows extensive preservation of all stabilizing structures – the ligaments, muscles and bones. The intervention minimizes damage to the soft tissue around the spine. This means no major scars, and the healing process is usually less complicated than for traditional surgical methods. Subsequent wound and muscle pain occurs only very rarely. 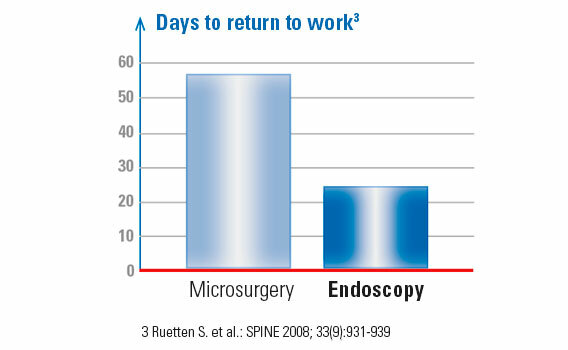 Due to a faster recovery and shorter post-operative hospital stay, an earlier return to work is possible. 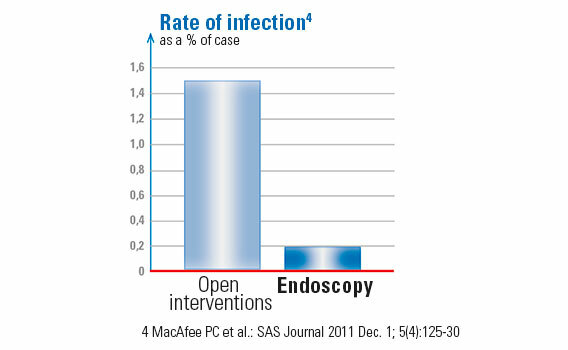 In general, risk of infection is lower for endoscopic operations than open surgery. Endoscopic disc surgery not only demands a considerably skilled surgeon, but an approach and technique in the background providing optimal operating conditions. TESSYS® is a milestone method that is achieving excellent results with the multifunctional operating system – even in difficult cases. The surgical system uses a lateral endoscopic access route for the gentler minimally invasive removal of herniated disc material through what could be thought of as a natural access path – the intervertebral hole (foramen). Have a look at patients’ reports about their experience of endoscopic disc surgery with the TESSYS® system!